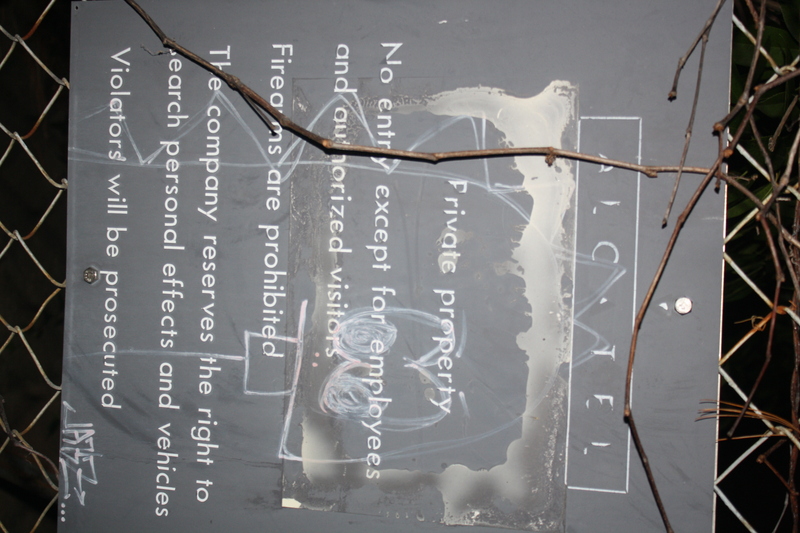 Private property? Grab your camera. Let’s go. Hidden in the shadows less than 100 yards from Trader Joe’s on Wake Forest Road there is a building. It’s much more than just a building, actually. It’s a complex the size of a high school or small hospital. The complex is an abandoned communications research facility that was once known as Alcatel. Yes, I realize that name evokes Alcatraz imagery and yes that was one of the reasons we were so excited about exploring it. Anyway, this enormous building has been a locally-famed urban exploration spot for years. We had heard stories of subterranean tunnels and hallways that went on forever. We also knew that this abandoned area was a hotbed for criminal activity of the drug sort, plus a common home for the homeless, but choosing a weekend when the temperature was about freezing assured that we would be alone in Alcatel. And so we went. Daniel, myself and his girlfriend who will be nameless in this blog until I’m told differently. This wasn’t our first ro-day-o, so we scouted the area for a decent hour before finally settling on a parking spot where we left the van and headed behind the facility. We opted not to park in the nearby shopping center to avoid any “Imperial entanglements,” but as you’ll find out later, our spot in the loading area of the complex was mine and Daniel’s fatal mistake. Well, not really fatal. Nobody died. Just let me finish. We made our first movement past the dilapidated barb-wire fences and passed incredibly creepy sheds that looked like they could have been prison cells. We continued around to the back of the complex where we found a building with doors and stairs. We climbed up the stairs to find a room that can only be explained through Zelda analogy. You know how in video games, you’re running around looking for the boss and you always seem to stumble across a map? You kill a little minion or use a small key and all of a sudden you have the entire blueprint to the dungeon. Why do the evil bosses always leave a map around? I know for a fact the Deku Tree would have broken a lot more kids into tears if there hadn’t been a map, but for whatever reason there always seems to be one. We found the map room. Blueprints were everywhere of the very complex we were exploring and we took note of where we were and wanted to go. We also happened to take a map, and it will be a cherished heirloom between the three of us for the rest of our lives. 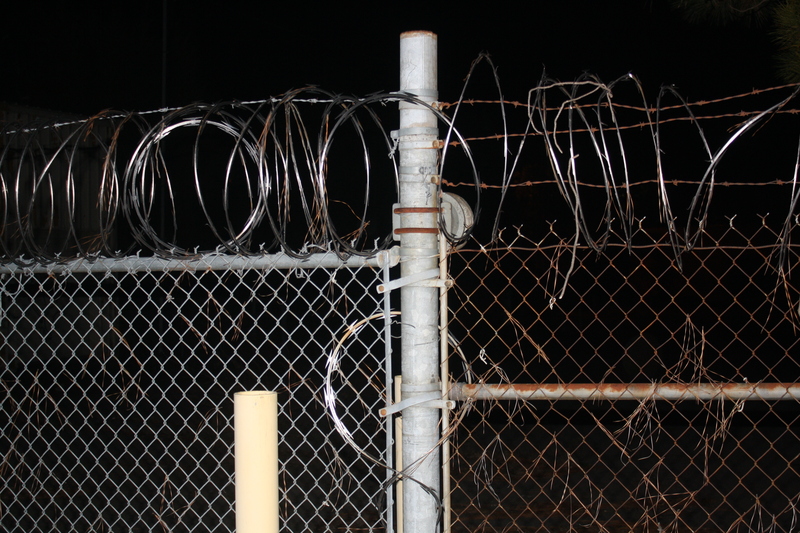 We backtracked through some more barbwire to explore the north gate and then re-entered the campus where we decided it would be best to begin the actual exploration of the big building. We entered through a large garage door and were floored by the size of the place. 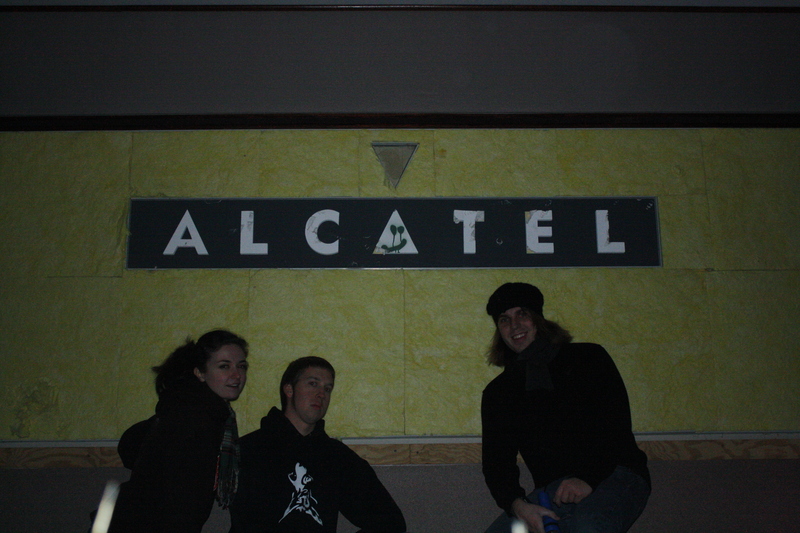 With fluorescent bulbs, plaster and ceiling tiles everywhere, it was clear that we weren’t the first to set foot in Alcatel purely for exploration purposes. Graffitti lined the walls and there was evidence that those before us had let off steam by taking part in some old-fashioned destruction. We obliged a bit. Flurorescent bulbs became the currency of our dominion as we sought them out for the purposes of finding new ways to break them. The popping sound rang out through the halls of Alcatel for ages, but Daniel wasn’t done. I tell you, Mr. E. was on a mission that night. While his girlfriend and I were content with our bulb busting, he had the notion that our best adventures were out ahead of us. And so we found a bathroom. It’s important to note that this building complex is not maintained by anyone at this time so there’s no chance that light switches, fire alarms or anything are working. And that’s when I saw the fire sprinkler. “Mr. E.” Go ahead and say it to yourself. Then you’ll get it. Now, because of my dad’s profession, fire and fire prevention have always been fascinations of mine. My dad has rigged fire extinguishers to spray water and I still have an issue with lighting matches without an adult present, but the fire sprinkler has an even higher allure. In the dorms, it was well-known that if you so much as sneezed at a fire sprinkler, there was a chance that it would explode and spray hundreds of gallons of nasty, disgusting water all over your room. Farrell used to wince every time I bounced a ball in a residence hall and I extensively covered a sprinkler incident on campus when I was news editor. So when I saw it and processed the knowledge that all of the security systems were ill-maintained, it didn’t take me long at all to use my poking stick to whack the little mercury vial. Of course I had a poking stick…it’s necessary for any true exploration. I whacked, but couldn’t connect, so finally I used my poking stick as a chisel and jammed it into the tiny glass capsule. Of course it exploded on me. And it smelled horrible. And I smelled horrible. I spent the next 30 minutes struggling not to throw up from my own stench, but managed to keep it together as we pressed on. (It should be mentioned that the bulb hoarding and smashing continued throughout this experience). We explored the entirety of the first floor and then took the most ergonomic stairs ever to the roof. There were work sheds everywhere that we explored, carefully testing the roof’s strength throughout. Time for a side-story: At American Tavern in Athens, Ga the urinals are brilliantly sided with chalkboards at eye-level to cut down on vandalism. This allows guys to draw as many penises as they’d like, and all the janitor has to do is wipe it down with a cloth and it’s all clean! Gosh I thought it was hilarious. It was there that Daniel helped me relive one of my all-time favorite tweets, by writing “Where’s the marker,” in marker before taking off with said marker. Anyway, we re-entered the building on the second floor by opening a door that stood beside a creepily detailed Boogeyman from the Nightmare Before Christmas. We continued our exploration, but began to notice certain knick-knacks on the ground that would make fine additions to our home decor. I happened upon an exit sign and a fire alarm. The intent was to wrap the alarm up for my dad’s Christmas present and dare him to ask where I got it. Yes, my urban exploring outfit consists of a beret. 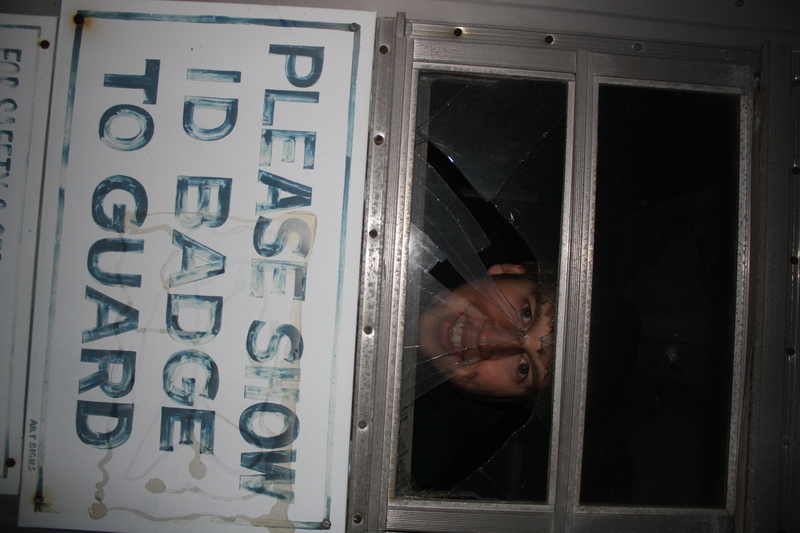 Daniel also had an exit sign and having exhausted every corridor of the building (we had been at it for four hours straight) we headed to the van to drop off our debrisouveniors before mounting the building one final time to go to the uppermost roof. After loading the cargo, I placed my hand on the van trunk door to pull it closed with Daniel to my right when everything got bright. Seeing a squad car pull up from our right paralyzed us behind the car. “I should probably close this, right?” I said under my breath. “Yeah,” Daniel said. And so I slowly closed up the van. I began to wonder if the cop had seen us in a Jurassic Parkesque hope that if we were still enough, the squad car may U-turn out of the abandoned building parking lot and think nothing of the van and three punk kids standing around it. Of course the car stopped, though. So I approached and explained that we had just been walking around and taking pictures. I was glad I had my camera on my shoulder for such an innocent explanation, but she wasn’t impressed. “Just some trash we found that we thought would be neat to have,” I replied calmly. And ladies and gentlemen, this is the first time it occurred to me that we weren’t getting off with a warning. I asked for it, but was cut off rudely. She asked for identification and sent us to sit in the van while she processed us where Ty Johnson nearly had a nervous breakdown. This is where Daniel’s girlfriend was most comforting. She assured us that everything would be okay, which definitely saved me some tears and helped ease Daniel’s mind as well. A back-up car had come up while Daniel was looking for his ID and the officer was checking out our “stolen property,” but it left while we were freezing in the van. That’s when Daniel’s girlfriend quieted my heartbeat by pointing out that there weren’t enough seats to carry us all to jail. Thinking back I’m not sure if that is true or not (Jerry, George and the Smog Strangler all rode in the back together…) but in the moment it was all I needed to keep breathing. After processing our information and finding that we had never so much as spit on a sidewalk according to our records, the officer was much more amiable. She handed us citations and explained that she wasn’t arresting us, mentioning the first offender program and such before sending us on our way. And so we took the long way home, looping around I-440 where at one point, we all burst out laughing. But the aftermath of the crime was where this experience truly got weird for me. → I loved Phill, too.